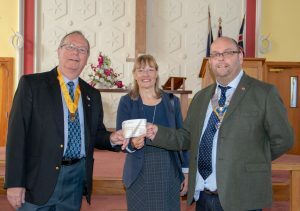 President Mark Penn and Vice President John Brett were delighted to present a cheque for £5,000 to Trinity Methodist Church, Pier Avenue. The Church applied for a donation towards refurbishing its kitchen. Many groups use their facility, every day of the week and it is also used to feed and support people in need. This is an on going refurbishment project by Trinity Methodist Church, and Clacton Rotary Club was delighted to be in a position to support the Churches excellent work in the local community. Both Mark and John said the application had been received by the Club’s Community Committee, and that the request had been strongly supported by its members. President Mark said, “This wouldn’t have been able to be funded without the excellent work carried out by Rotarians and our supporters at the Clacton Air Show Carpark in August each year. The proceeds from the carpark generate funds that enable the Club to support deserving projects such as this, both locally and within the international community.